AUSTRALIAN agtech company Direct Injection Technologies has gone live with its equity crowdfunding campaign, attracting 86 percent of the funds it was seeking within 24 hours. DIT claims to be the first Australia agtech company to utilise crowdfunding to build capital. The startup is offering a 10 percent stake in its business, valued at $1 million, to retail investors through the Equitise fundraising platform. Crowdfunder investment starts from as little as $250. DIT says it has increased its customer base and revenue by 300 percent in the last six months in its supplementation business, and turned to equity crowdfunding to fund growth, hire staff, set up ‘micro factories’ and invest in R&D. The company plans to scale its supplement technology as well as starting to commercialise other disruptive products and services in development, aimed at solving problems ranging from digitising farms and providing connectivity across vast areas, to animal ID and GPS tracking. Following an acquisition of its biggest competitor last year, DIT claims to be the world’s leading water supplement technology company, changing the way livestock in Australia are supplemented and managed. Its patented technology in water nutrient supplementation for livestock provides savings and efficiencies to farmers nationally, it says. The conventional method of supplementing cattle and sheep is through dry licks, which is labour intensive, inaccurate and expensive, DIT says. The DIT technology proportionally doses supplements into livestock’s drinking water using remotely managed and monitored dispensers and specially-formulated supplements. DIT is the only company in Australia providing this method of delivering nutrients to livestock. “As a result of the extended drought, DIT has experienced a spike in interest from livestock producers, resulting in a significant increase in customer numbers and exceeding the 2018 financial year revenue figure by 38pc in the four months to October 2018 alone,” the company said in a statement. “With over 92 million sheep and cattle in Australia, all of which need supplements, there are huge opportunities for DIT to scale at-pace.” The company recently completed a purpose-built facility in Toowoomba, with the capacity to produce $100,000 worth of revenue-generating activity per day. 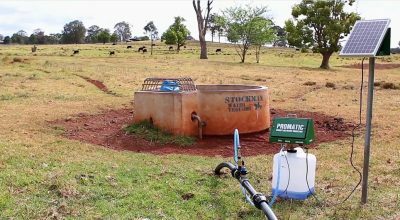 DIT principal Mark Peart said he turned to equity crowdfunding in an effort to realise the opportunity that water supplementation brought to the Australian livestock industries. “Crowdfunding means everyday Aussies can have a hand in the future of our farming industry, getting behind farmers and potentially making a profit to boot,” he said. “My uncle was the first person to invent a device to proportionately measure and dose through water supply. My father commercialised the concept, but then retired. With recent advances in technology, the family is now able to continue the legacy and put this into practice,” he said. “As animals drink proportionately to their body weight, it’s more accurate administering the right dose of nutrient to the animal and reducing wastage which has been the issue in the past with previous water supplementation,” Mr Peart said. “Our product saves producers time, money and improves the efficiency of on-farm practice. Secondly, it’s less expensive, reducing the cost from upwards of 40c per animal per day to just 8c, and that doesn’t include the savings on labour and wear-and-tear on farm equipment. A producer with 500 head of cattle can cover the cost of buying the dosing unit in just 50 days,” he said. Equitise co-founder Chris Gilbert said DIT was a perfect example of an Australian business that turned to the ‘crowd’ to help fast-track and grow its already successful business. “This is such a rare opportunity to be a part of an innovative agtech business that is set to revolutionise the way Aussie farmers supplement their livestock, helping to future-proof our food sources and give some relief to our farmers, all while potentially making a return on investment,” he said. Equitise is an online equity crowdfunding platform connecting startups and high growth businesses with a broad range of investors. It says it helps businesses grow and thrive in a simple, intuitive and social way by disrupting the investment marketplace and removing traditional funding barriers and costs.